NEW YORK — Expect more talk about small business issues like taxes and regulations as the post-convention presidential campaigns intensify, with Republican Donald Trump and Democrat Hillary Clinton trying to woo entrepreneurs and show they know what company owners need. It’s a perennial issue the way education and jobs are – part of the rhetoric designed to appeal to voters’ emotions, says David Primo, a professor of political science and business administration at the University of Rochester. “No one’s against small business,” Primo says. The two candidates, as expected, have different takes on how to help small businesses. Delegates to the nominating conventions have many global and national issues on their minds as well. And it’s difficult to tell if owners might be swayed, positively or negatively, by Trump’s business record or Clinton’s lack of private enterprise experience. More than on the nitty-gritty of campaign platforms, small business owners – like many Americans – may be likely to vote based on how they feel about the two candidates. Delegates to both conventions are interested in social issues, national security and other matters as much as small business concerns. “I’m going (to the convention) as an American. I care deeply about our country and I’m concerned about my children, and grandchildren as they grow up,” says John Dinkel, a Republican convention alternate delegate and part-owner of Dinkel Implement Co., a farm and heavy equipment dealer. But Dinkel, whose company is located in Norfolk, Nebraska, is also concerned about issues like regulation – a topic the candidate’s son, Donald Trump Jr., mentioned briefly in his speech Tuesday. “Why should we work our butts off as small business people when we’re going to have tons of regulations dumped on us? It wears on us after a while,” he says. Half of owners surveyed in April for the National Small Business Association, an advocacy group, said they’re affiliated with the Republican Party, while 21 percent said they identify with the Democrats, 19 percent call themselves independents and the remainder were split among other parties or did not answer. Nearly half said they believe Republicans best represent their companies, but less than a quarter said they vote a straight party line. Christine Chin Ryan, a delegate to the Democratic convention, wants to discuss issues in the Asian and Pacific Islander population, but also plans to attend meetings on small business and speak with party officials about entrepreneurial concerns. Trump’s positions on taxes, regulations and energy talk about undoing Obama administration policies. Clinton speaks about making it easier for small businesses to get financing, and the need to build on the status quo to help companies grow. Her statements focus on the need for investment, particularly for businesses owned by minorities and women. She says she plans to help these owners get financing and training, and for incubators to be created in underserved areas. She’s proposing tax credits to bring private investment and jobs to communities with high rates of poverty and unemployment. Clinton also says she’ll start a nationwide effort to cut regulations at all levels of government, and help businesses comply with the rules. She proposes what she calls strategic tax relief for small businesses, not large corporations. She doesn’t provide a target percentage for cutting taxes, but she does say she’d simplifying tax filing procedures. She supports President Barack Obama’s health care overhaul. The proposals on Trump’s website generally don’t mention small business by name, but they do target some owners’ concerns. He supports lowering the tax on business income for all companies to 15 percent. Under current law, depending on the type of business, income can be taxed between 10 percent and nearly 40 percent. Trump supports repealing the health care law, and wants trade agreements toughened to give the U.S. more benefits. He also wants to restart the Keystone XL oil pipeline project that Obama has rejected, which was projected to provide some business for construction firms and other small companies. Trump also says he’d eliminate federal regulations that restrict domestic oil production. “Any regulation that is outdated, unnecessary, bad for workers or contrary to national interested will be scrapped,” his website promises. Trump’s business record has been cited by both his backers and his opponents. Supporters applaud his successes and point to his wealth as evidence that he’s a capable manager. Detractors say the fact that some casinos bearing his name have landed in bankruptcy casts doubt on his business ability. Clinton talks about being the daughter of a small business owner; her father ran a printing company in Chicago. She says she’ll build on the record of her husband Bill Clinton’s administration in helping small businesses get financing. 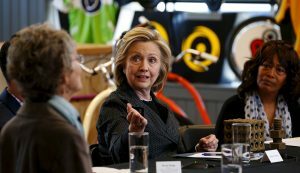 Clinton must appeal to small business owners even as she is seen as pro-labor, says Timothy Hagle, a political science professor at the University of Iowa. Like other Democrats, she’s likely to focus on small business issues when she’s speaking to groups of owners, and about labor issues and the minimum wage when she’s speaking to union members, he says. Trump’s in-your-face personality may appeal to some business owners, Hagle says. “One of the reasons why Trump is liked by a lot of people is that willingness to fight,” he says. But it’s how owners feel about the candidates’ ability to be president in all regards, not just when it comes to small business, that will determine their choices, says Primo, the University of Rochester professor. “A vast majority of voters trust their gut,” he says.